The proposed 172 can just be 72A, and 121 can be extended to Cherry beach. Why complicate things? Steve: Equally annoying is that only one option is shown rather than a few alternate networks. The waiting time especially with trademark TTC short-turns could be more than half an hour and well over an hour on weekends and evenings when drivers run at their own schedules due to lack of supervision. My concern is this: who would wait so long for a half kilometre ride on the new Cherry tracks? Would people not just walk? Under the circumstances, I don’t think a 514 is needed. What might make more sense is a 501 branch to Leslie Barns to reduce headway on Queen St West as transit ridership is far higher in Queen St West area compared to in the Neville loop area. 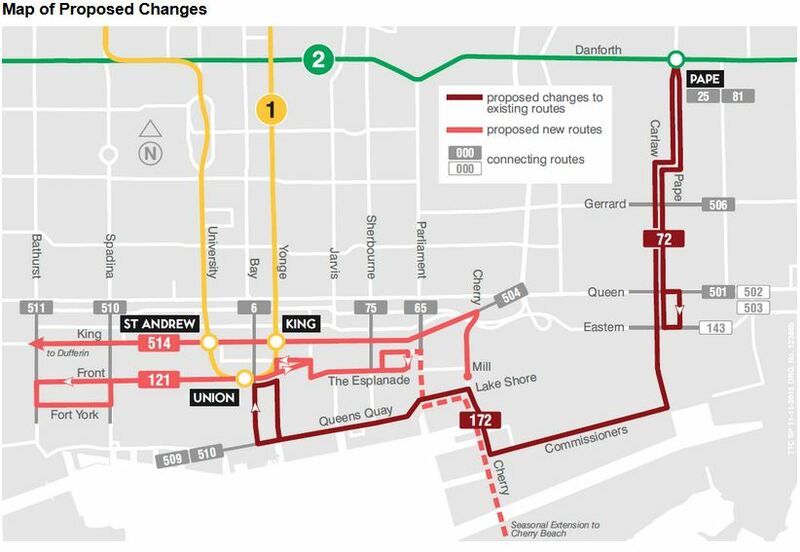 TTC didn’t know what to do with the 72/172 split so they plan to completely restructure the southern downtown routes. This is more interesting but I don’t think it will happen anything soon. It’s still possible for a September 2016 implementation if they start service on the 514 Cherry Car. I hope by having separate route numbers mean service won’t blend. I can see why this change is proposed. It’s developed for reliability, not convenience. The new 172 bus wouldn’t get stuck in traffic running on Queens Quay. They could blend service during off peak but definitely shouldn’t during rush hours. The new 172 won’t see much service, probably 20-25 min headways (same as currently) which won’t help George Brown students that much. The busier part of the current 172 is obviously the Esplande section. The new 172 will probably get a new name. Maybe 172 East Bayfront bus till can build the 513 East Bayfront LRT. 513 is probably reserved for this line since it has appeared in the SmartTrack planning. The new 121 bus could take on a portion of the existing 509 ridership and an alternative to the 504. It would be nice to see the 121 extended to Distillery District/ Cherry Loop oppose to ending shy of Parliament. Frequency rush hour service would be nice. The 514 Cherry Car is very questionable. They might as well thought a bunch of cars on this route and let them run on their own schedule. I don’t think it will make it to either end in rush hour. Unless the TTC/City of Toronto do something about transit on King, more streetcars isn’t going to help. From my experiences 10 years ago, blended service service with the (then) 72 and 72A services did not work and I see no reason why it would work any better now than before with the heavier population and traffic along the western half of the route/routes. If it were operated as a separately scheduled route then it might work better but the TTC isn’t going to spend that much money on operations. Cynically, what’s the point of showing a few options when the fix is in? Those of us who use the 172 (formerly the 72) along Mill Street on a daily basis will resist the loss of bus service which we have had for at least 12 years. No doubt I am not seeing the “big picture” but why drop this section of the route which carries riders from the Mill Street condos, and go along Lakeshore instead where surely the opposite applies? I live on Parliament Street in the neighborhood of the Distillery District and support the plan proposed by Steve Munro, for at least the coming decade. Steve: I am not exactly sure which plan you refer to as I have not “proposed” anything beyond some changes to the TTC’s plan and the need for info on service frequencies. Lines on a map are not much use if the bus shows up every half hour or so. If the major objective is to reduce the number of automobiles traveling between the downtown district and Eastern points such as the Distillery District and the neighborhoods between Commissioners Street and Pape, you have planned well. Residents and employees quickly learn how to use public transit even though some may complain about the changes. It is important to retain bus service along the Esplanade. There are many residents who need that service. At present, there are relatively few individuals who travel to destinations on Commissioners Street. Still, it is a good route to reach the neighbourhoods mentioned above as well as Pinewoods Studios. There are a few things to keep in mind. One is that within 10 years, businesses and residences will be established on the Port Lands, but we don’t know yet where. We must keep in mind that, to a degree, those new developments will depend on access to public transit; presently, bus routes. It is likely that many (more) businesses and residences will be developed in the Port Lands along Cherry, Commissioners and once it is built, Broadview. I’m sure that Broadview service is part of your longer term plan. Steve: Again, it’s not “my” plan short or long term. As a (Distillery District or GWNA) resident who uses the TTC frequently, I welcome the introduction of service along Queens Quay to Union Station from our area. It makes damn good sense. I do not think that the service is too far from the Distillery District. Most people enter the District from Parliament, not Mill. Once Cherry Street service is operational, people will have that option as well. Did the TTC Board, in fact, finally agree to fund streetcar service on Cherry Street yesterday, after all? Couldn’t determine the outcome from the various motions. If it didn’t agree to funding the service, then this survey’s basically useless. Steve: They did not agree to the additional funding, and this means that Service Planning will scrimp and save on other routes to find the money. Of course it is totally unclear why this was not proposed to the Board as a service reorganization complete with info about frequencies and relative convenience (a favourite word when Service Planning compares options), not simply as service on Cherry Street itself. You are right that the 6 Bay bus is a major transit link for the George Brown folk and having a stop for it on Bay Street and another for the 172 on Front is unacceptable and not well thought-out. (The 75 is also a major route for GBC students at the Waterfront Campus.) The current routing where the 172 passes King station has VASTLY increased its ridership as it can now be used by many as a useful alternative to the 504. Moving service back to Front/Yonge is not going to retain these riders for the new 121 bus unless this service will be very frequent and reliable. It is also unfortunate that it will loop back west at Berkeley/Princess and not go east to Cherry where it could loop back along Eastern and also serve the folks at the Distillery. Frankly, the current situation looks far better than the alternative they seem to have decided on (and have now designed a survey to support their decision); the real problem with the current situation is not the split (annoying though it is) but the fact that there was absolutely no coordination between the two ‘branches’. Steve: The whole thing has the feeling of a very amateurish last-minute job. It violates basic procedures within TTC including community consultation and any comparative evaluation of alternatives. The back of a very tattered envelope. Cutting short the 121 service so it doesn’t get to Mills seems bizarre. Better yet, get it to Mill, and then keep going into the West Donlands, and loop ait at Bayview/River (Lawren Harris Square). Steve: I really don’t think that whoever designed this service has any idea of how the eastern waterfront actually works. Just lines on a map, and an incorrect one at that. Front and Fort York Blvd are separated by a large rail yard. Even though there is a bridge, it’s a long walking connection for Westbound passengers on the 121 to get to City Place. I recommend 2 new routes instead of the proposed 121. The first route would start at the Esplanade (with the same route as the 121), travel West along Front St. to Bathurst, take Wellington to Strachan, and extend down East Liberty to Liberty Village (and loop back). This first new route could provide an alternative to the 504/514 streetcar on King for passengers travelling to & from Liberty Village. The second route would start at Maple Leaf Square, go along Bremner, Fort York Boulevard, and then make a loop back using Lake Shore, Strachan, and Fleet. This route would serve City Place and the Fort York condos. 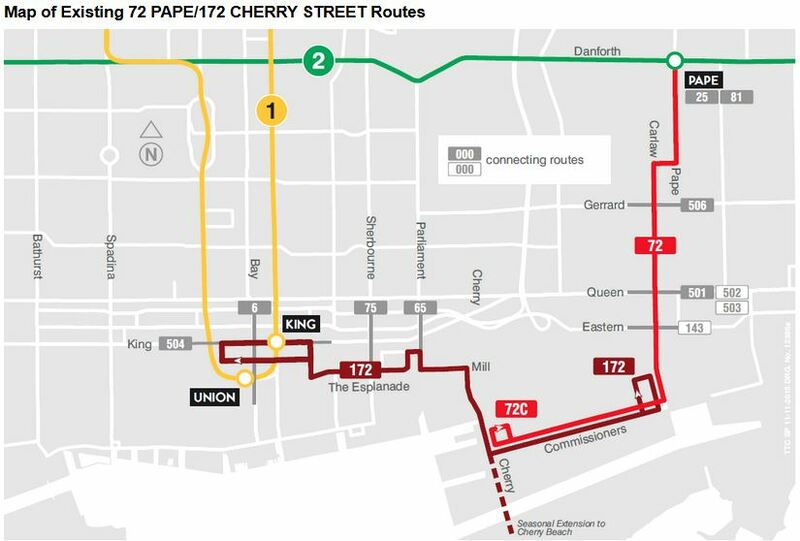 Retaining the 172 number while running it to Pape station in parallel with 72 is a crazy deviation from the standard TTC route structure (such as it is). It clearly should be 72A, though perhaps the TTC is likely to rename 172 “Queen’s Quay East”. Perhaps they think a 72 “Pape-Queen’s Quay” route name would confuse passengers for buses heading only to Eastern Avenue. It’s an excellent point about 172’s pick-up point at Union Station being inconvenient for students heading to George Brown. The TTC are likely thinking about ease of operation, here, and not passenger convenience. They’re probably shuddering at the thought of looping the route via Front, Yonge and Wellington. It’s wild seeing the 121 Front-Esplanade bus come back to life. The loss of service on Mill Street is a mistake. At the very least, the line should be extended to Cherry Street to continue the old service, and connect to the Cherry streetcar. I do hope we will see the Cherry streetcar operating by the end of 2016. It would be most frustrating to spend that money on the tracks and not use it properly. If we ever bring back the 508 Lake Shore route, is that likely to use Cherry as its new eastern endpoint? Looping via Yonge then Bay would require 3 left turns instead 3 right turns. Students can use NextBus to see which one is coming first. Bringing back 121 Front-Esplanade is a bit of surprise. It ended in 2000 when the Harbourfront Streetcar entered service, with the Esplanade section replaced by an extension of the Pape bus. Since then there have been many condos built on Front, Fort York and the Esplanade. I wonder how long they have been holding on to route number 121 in anticipation of this. I expect the bus will layover on Fort York, so westbound passengers can stay on until the bus comes around to a stop near their condo. Most of time there one will be arriving several minutes before the other and people will be looking up which bus to take before they are out of Union station. I love the blinkered view that misses the fact that the escalator to the street is on the NW corner. Also, no, they will not all stop in the sea of humanity in Union concourse just to see which bus is next. I was thinking before that both these new routes would be more useful outside of peak when they won’t be so impacted by congestion. Steve: You do realize, I hope, that my comment about not serving the stop was a joke showing how the TTC would solve a “problem” my making the service less useful. If the 121 is extended to Cherry Beach can we renumber it to a 14x-15x and call it the Cherry Beach Express? Also what about the 121 using Bremner and Simcoe instead of Spadina? It’d be nice to avoid some of that really heavy congestion on Spadina and Front. I’m surprised there’s no provision for Cherry St service heading east on King. Is there truly no demand to/from that direction, or simply another glaring oversight? Steve: The primary demand is westbound to downtown. The whole question of using the curves to the east, other than for carhouse moves, will have to be part of a future rethink of transit in this part of the world including what happens when/if Broadview is connected through to Commissioners Street. To address the stop location vs 6 Bay at Union, why not loop around Union Station via York, Front and Bay? Steve: Unless the 172 comes south on Bay to Front, it will not share the stop with the 6 Bay buses, and students bound for GBC will be torn between two locations to wait for service. I am not totally familiar with traffic situation around GBC, but couldn’t they run westbound 172 (and eastbound too, if we feel like it) buses through the GBC via Knapp Lane, Dockside and Lower Sherbourne? I know that would add a couple of minutes but could be worth the sacrifice. Steve: I suggested this in my article. Totally agree with other comments on here that a loop of 121 would make more sense via Front, Cherry, Mill, Parliament so that there is a direct connection to Distillery District and also to 514. This way if you are leaving from Distillery you could wait at Cherry/Mill and take whatever comes first. Steve: I have the distinct feeling that whoever designed these routes has never been to the area, or only briefly as a tourist. My question is where is the TTC getting the streetcars for the 514 run? They cannot operate the 508 because they don’t have enough streetcars, plus the TTC is running buses on the 504 and 501 to supplement service. The new streetcars are slow to arrive and the TTC is scrapping its current fleet. Then again, can I really expect any logical decisions from the TTC? Steve: By the time the 514 starts to operate, April at best, more new cars will be here. That’s the idea anyhow. The new route 121 should obviously serve Cherry and Mill St.
Omitted is a streetcar service from Broadview to Mill St. This could serve a relief function to the eastern waterfront and connect with both 172 and 121, until, one day decades away, the QQ streetcar is built. It’s more a peak issue than an off-peak issue. Presumably at peak, they can just use the existing 504 vehicles that turn at Broadview or Parliament and Roncesvalles. So is there really much more required? Perhaps less, given the mileage to turn at Cherry is less than the Parliament/Dundas/Broadview loop – not to mention those turning at Dufferin. That they are currently using 21 buses to run 504, is a different issue really, that already exists whether they open Cherry or not. Hopefully it gets resolved in a few months. The 121 bus originally was in service from 1991 to 2000. During that time, whenever I was on Front Street (usually to and from the Metro Toronto Convention Centre), I NEVER used it. It was either was because it wasn’t frequent enough, or I just never noticed it. Maybe with smartphone apps, it may be a different story this time around. Instead of #514 running between the Cherry St. and the Dufferin loop, would it make sense to split the King streetcar service? That would provide overlap in the busiest central section of King, and both new routes would be shorter and hopefully more reliable than today’s #504. Steve: The almost certain result would be that 504 West would usually turn back at Church, and 504 East would not get past Bathurst, thereby defeating your service design. That’s an interesting possibility. However, a) Is there enough demand between those points to make a streetcar route busy; b) Is there enough room at Broadview Stn to serve an additional route. Steve: My gut feeling is that until there is a through route from Broadview to Queens Quay, not just a stub ending at the rail corridor, there will be little demand for this type of route. Broadview Station is crowded already, and once we do get a “Broadview” car, I think there will have to be a redesign of the “King” route. However, this is years in the future, and I’m not going to contemplate the schedule details yet. Broadview is overcrowded – but the DRL presents interesting possibilities. With talk of a Gerrard/Carlaw GO station/DRL interchange it crosses my mind, that you could reroute 505 so that it just keeps going 500 metres down Dundas East into a new loop connected to this interchange station. This would free up a platform at Broadview station. Steve: A lot depends on where the DRL station was located. It is more likely to be north rather than south of Gerrard to serve redevelopment of the Gerrard Square property putting it a bit further from Dundas. Yes, if between Gerrard and Majrory, that would make that difficult – though a connection up Carlaw to a loop at the tracks might work. It is all cart before the horse though … but ultimately, I think that if the DRL get’s built, pushing the 505 terminus east to the DRL makes more sense then running it north to Broadview station. Would be nice to see some detailed modelling on that. Steve: The DRL is so far off in the future, possibly beyond some of the work in the waterfront, that we cannot count on it as a “solution” to streetcar routing problems. Yes: cart/horse definitely an issue here. I’d also say that it would depend on what the future development plans are for Carlaw. It may end up making sense to extend the 505 to Gerrard and Carlaw as part of the SmartTrack/GO RER station construction there even if the DRL project hasn’t broken ground at that time. Steve: I will very surprised to see a SmartTrack station at Gerrard given how close this would be to Danforth or to a future Queen/Don station. Well, there was one indicated on Tory’s map and we’ve seen his dedication to making it happen regardless of what reality would suggest. Steve: Many possible stops are on Tory’s map but this doesn’t mean they will all be built. Some are alternatives, and some are simply impossible from an engineering or operational point of view. Tory himself has already admitted that the fine details of SmartTrack are subject to GO Transit’s engineering considerations. However, what I was ultimately getting at is that with the redevelopment that has been occurring at Dundas and Carlaw, it may be prudent to ask if some sort of core bound service should be established along Dundas between Carlaw and Broadview as part of the route 72 discussion. Rerouting the 505 for that purpose would only make sense if you have some sort of heavy rail link at the east end of the route. Is this a public meeting? I can see nothing about it on the TTC website. Steve: There was a News Release this afternoon, and The Star has picked up the story. I think the TTC needs to think more about and standardise how it deals with route numbers and “branch letters”. In my opinion it is very confusing to have recently created a 304 streetcar route that is exactly the same as the 504 – except it runs at night. I can certainly see the reason for a 3xx number if the night route is different but NOT when it’s identical. Similarly, why are they proposing to create a 514 route when 90% of it is identical to the existing 504. Why not call the Dufferin-Cherry ‘line’ the 504A? Steve: Even more to the point, the TTC intends to letter the various alternate destinations of the routes on the Flexity signage. One might be tempted to wonder whether “A” to “Z” gives enough scope for the peregrinations of some routes. I think the “514” would be better suited as a Parliament car running from Castle Frank (or even Broadview) Stn. along Parliament to King, then down Cherry, in my humble opinion; although I am biased due to my infatuation with brining streetcars back to Parliament St. I’m not sure if the ridership would justify it. The “513” could run between Union along QQ to Cherry, King, Queen, Broadview. Or vice versa. Steve: Dream all you want, there isn’t going to be streetcar service to Castle Frank Station. The structure is not designed to support streetcars, leaving aside the fact that Parliament is a notoriously slow north-south route. To be fair, considering the traffic issues on that portion of Bloor, you would probably take advantage of the unused subway deck on that part of the viaduct and construct an underground loop on the south side of Castle Frank station if you wanted to restore the Parliament car. Of course, that idea has its own list of problems and it doesn’t solve the slow running along Parliament. But David, Streetcars have never had letters after the route number, except for the 512L Lansdowne service on St, Clair after the replaced the route names off and replaced them with numbers. But then they never had numbers until they designed the front end of the CLRVs so they couldn’t put a name and destination on smaller sign. Somehow they managed to add Via King on the 504 cars and Via Dundas on the 505 cars when people kept getting on the wrong car. It looks like the TTC has not really thought this idea through or the bus route planners never talk to each other. Either that or the TTC wants it to appear that there are more Streetcar routes than actually exist. They could not bring back the 507 route even if they do restore it in reality because that would admit that they made a mistake. One of my neighbours sent in an email and got this “fairly positive” (in her words) response. It will be interesting to see how they respond. Thanks for sending your comments along. We’ve received close to 1,000 responses to our online survey on the proposed changes and will be summarizing the great feedback we’ve received and integrating it into our analysis and final recommendations in February. Your comments echo some of the common themes – the need to re-establish the link between the 72 and 172 routes, as well as looking at potential extensions of the 121 to the east and west. We will weigh these suggestions against the benefits and tradeoffs to travel time for existing customers, the number of new riders we could attract, and the overall resources we are able to justify in the area, given significant needs across the city. Steve: That’s nice as far as it goes, but there is always that question of making service more attractive if it will also be more expensive and/or require more vehicles. Many good intentions have foundered on that constraint. That comment is frightening. The TTC doesn’t learn. I suppose the arrival of UberHOP to points along Front Street will alter the conversation about bus service along Bremner and The Esplanade. Since comments are closed on the Cherry Street construction thread I note here that they are (rather slowly) installing the overhead on Cherry. They have installed all the cross wires from King to (and around) the loop and seem to have just about finished attaching one of the copper conducting wires. I assume they work on this project ‘as time allows” as it will not open until April or May 2016. Has any consideration been given to the fact that for at least the next two years, the St Lawrence Farmers’/antiques market is on the Esplanade? On the weekends, it would make sense to have decent service going past the market — at least from 8 AM to 5 PM. Service during the summer and the PAN AM games along the 172 was really useful for marketers on the weekend. Having a low-floor bus, which the elderly could use to get directly to the market was great. Unfortunately, in September service dropped back from 12 minutes to 30 now, just in time for the cold weather. It’s a 2-3 block walk up/down hill to/from the 504, which is difficult for those with mobility problems. During Christmas season, the 504 is packed with people going to/from the Distillery District. However the routes are realigned, I’d like to see the weekend service past the market restored to PANAM frequency.